In 2-quart saucepan, heat butter, brown sugar, 1/4 cup maple syrup and the salt to boiling, stirring frequently. Remove from heat; set aside. In small bowl, stir cornstarch into 1/4 cup of the milk until dissolved. Add egg yolks; beat with whisk until blended. Into saucepan with brown sugar mixture, pour remaining 2 3/4 cups milk and the cornstarch mixture. Heat to boiling over medium heat, beating constantly. When pudding comes to a rolling boil, remove from heat. Pour pudding through strainer into large bowl. Stir in whiskey and vanilla. Cover with plastic wrap touching surface of pudding. Refrigerate at least 3 hours. In chilled medium bowl, beat whipping cream and 2 tablespoons maple syrup with electric mixer on high speed until stiff peaks form. Store in refrigerator until serving time. To serve, divide pudding into individual dessert bowls. Top each with maple whipped cream and maple flakes. 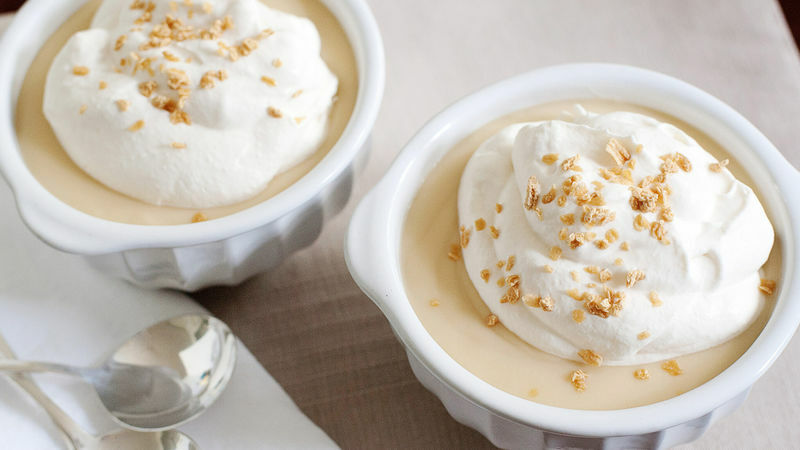 You can make this pudding up to 2 days ahead of time. If you prefer “skin” on your pudding, do not put plastic wrap directly on surface of pudding.